In the dying hours of 2006 I found myself 1) in North York, 2) in a car with three drunk friends, one hungry driver and, of course, my camera, and 3) blinking at an indiglo watch, wondering if 1:30AM meant we were going to eat at a Coffee Time. All of a sudden, Dharm (the driver) starts raving about this noodle place his friend took him too... How it's amazingly good, they've got locations all over the world and how it's going to sweep the city. 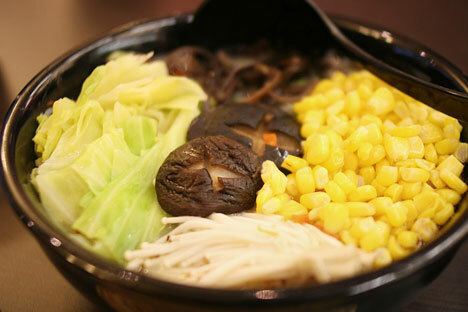 "I can't remember the name," he says, "but it's something Ramen . It's coming up." We all agree that it's probably closed anyways, but keep heading towards the location anyhow. 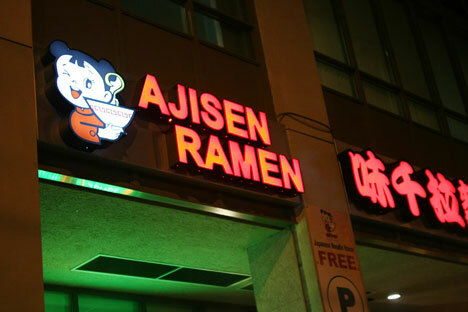 As we pass Ajisen Ramen , the drunkest of the drunks points and screams, "THERE! IT'S OPEN!!!!" and before I can look over, Dharm sends us screeching into a u-turn on this quiet stretch of Yonge St.
Thankfully, it was well worth the whiplash. Walking up to Ajisen, I was feeling a little sleepy, but one foot in the door and I was shocked right back into consciousness. 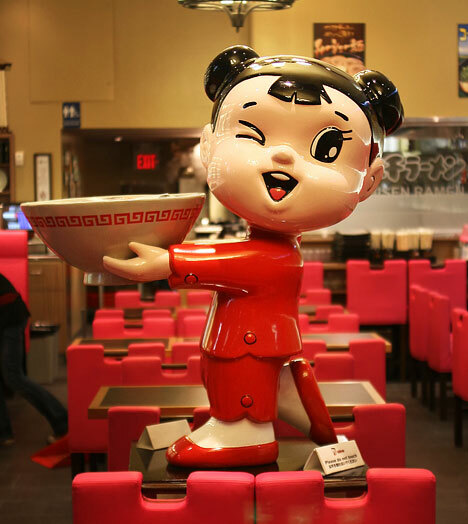 The hot-pink furniture, bright lights, mural and giant winking 'doll' could startle you out of a coma. Not that it really came off too over-the-top or tacky at all. It was great! We were seated in a comfy booth, brought menus and given a few minutes to figure out our order. 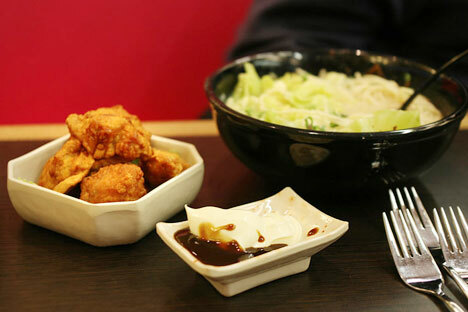 Thankfully, Ajisen is the kind place with a very visual menu . 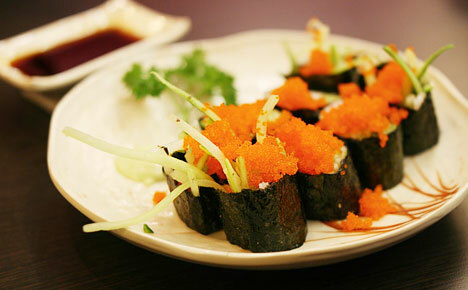 There is nearly one photo for every item, making ordering a breeze. 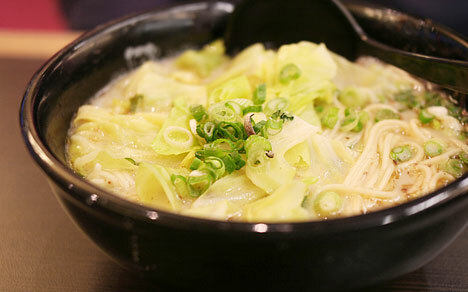 The white broth that comes with most noodle bowls is the house specialty here, so most of us go that route. Ajisen Spicy Pork Ramen (pictured at the top): This final dish proved to be the most memorable. Georgia, who ordered it, loves seriously spicy food, so when the server asked if she wanted either mild or very spicy, she didn't miss a beat with her "SPICY!" reply. 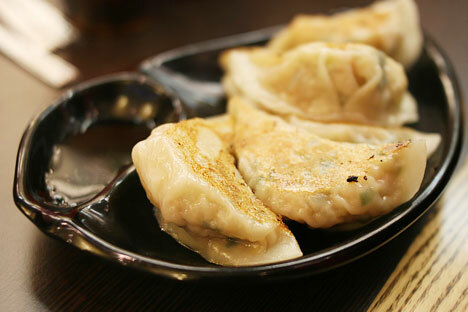 He warned that it was very spicy and joked that he didn't want her wasting his noodles if she couldn't hack it. She scoffed at his remark and told him to bring it on. Oh, and there was one more thing. Partly to try it and partly to help Geo, I ordered up a strawberry green bubble tea. For me, the key to giving bubble tea a thumbs up is whether or not the tapioca is great or absolutely gross. There is really no in-between.